Nate Miller's Tabletop Games: More Scrap Dogs with bases. More Scrap Dogs with bases. I'm working on some more pirates for my Solar Empires setting. These are more of the Scrap Dogs pirate band which I have shown before. They are of course made from Warhammer 40k Chaos Cultist. I've tried to convert them quite a bit because there are only five poses to work withe. I thought I would show the way I am doing the bases. Just some random scraps of granny grating and zip ties and other odds and ends to give the impression of a scrap pile. This was a simple and cheap solution to doing bases for these guys that I thought would look good for them. The bases are similar to what I have done for my other pirate band "The Blood Born" but I plan to make these even more heavily rusted when I paint them up. 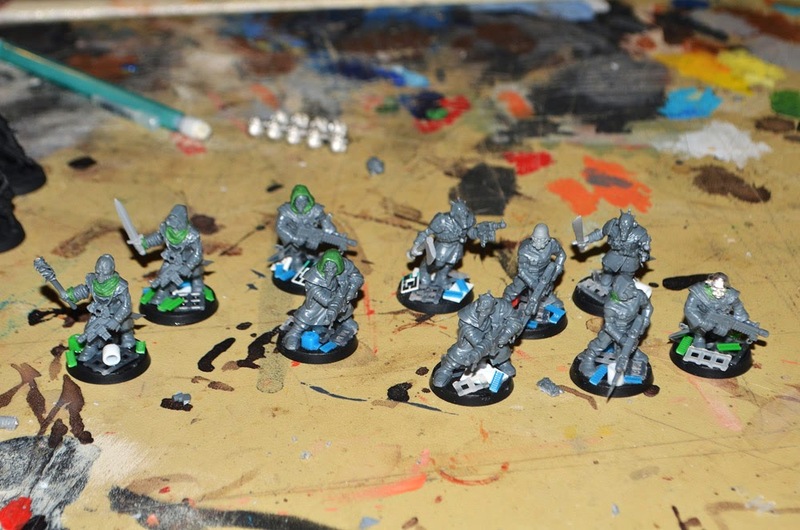 I now have 20 Scrap Dog raiders which I plan to use as the core of this small force. I plan to add some scouts and some heavier miss matched veterans as well and light vehicles and a few mechs. Scrap Dogs on the paint table.